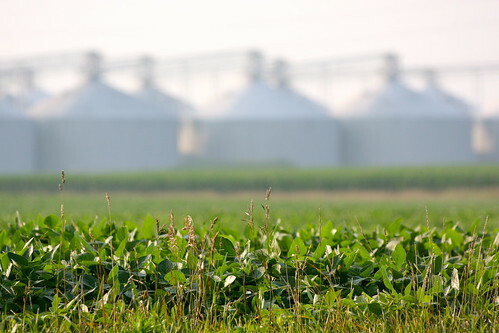 I came across this article, Are Your Corn or Soybeans Looking Stressed? in Wallace Farmer and was reminded that the late July heat could be the first sign of stress on corn and soybeans. The most common types of nematodes are the Plant-parasitic, which “are microscopic worms that primarily live in the soil and feed on the roots of plants. The other common type are soybean cyst nematode, (SCN). Collecting a proper sample for analysis is the key. Iowa State has a good article on their website, Sampling for Nematodes that Feed on Corn this Season. Checking your corn plants at the V6 Growth sage is the best thing you can do at this point. Collect 10 to 20 12-inch-deep soil cores from the root zone of unthrifty plants. Collect 5 to 10 root masses from V6 plants; the tops of the plants can be cut off and discarded, and soil adhering to roots can be removed as well. Place soil cores in a sealed plastic bag; roots can be placed in a separate plastic bag. Protect the samples from temperatures above 80 degrees, and do not be physically rough with the samples (by throwing them, for example). Deliver or send the samples to a laboratory for processing as quickly as possible; avoid shipping samples on Thursdays and Fridays so that samples do not sit in delivery trucks over the weekend. Similar sampling instructions can be found on the UNL Agricultural Site for SCN Cyst Nematode Samples. Midwest Laboratories has a certified nematologist, George Nelson. Turnaround time is of the essence and turnaround time is typically 3 to 5 days. If you need more information, please call and ask to talk to Mr. Nelson.